Cheap flights to Malaysia: Kuala Lumpur for €449! China Southern Airlines now offer cheap flights to Malaysia. 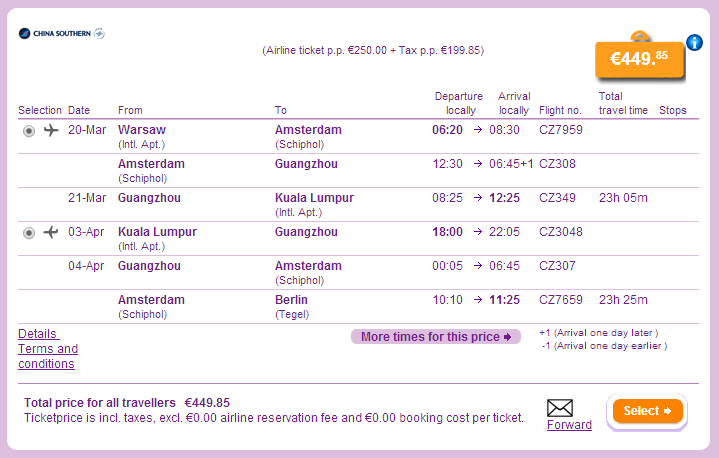 Multicity tickets Warsaw – Kuala Lumpur – Berlin are available for only €449! 23 kg luggage is included and you can expect 2 transfers. Warsaw and Berlin are connected with cheap Polskibus buses. Book via BudgetAir for the best price (click on Show extra search options). « Cheap flights to Russia: Budapest-Moscow for €42!